Gangs of highway robbers are targeting British tourists on holiday in Spain. Hundreds of visitors in British-registered vehicles or hire cars have had their possessions, passports and money taken in ‘quick and slick’ distraction muggings. 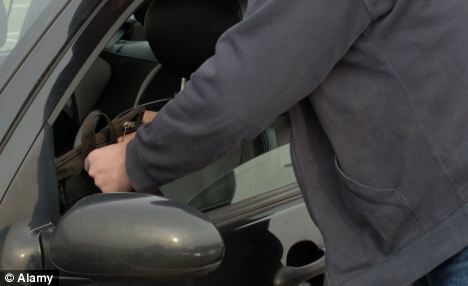 The thieves typically trick their victims with loud noises, apparent accidents, supposed vehicle problems or pleas for help – before stealing bags and belongings from their vehicles. As millions of families begin their summer breaks, the Foreign Office has warned British-registered cars are ‘an easy target’ for motorway thieves. 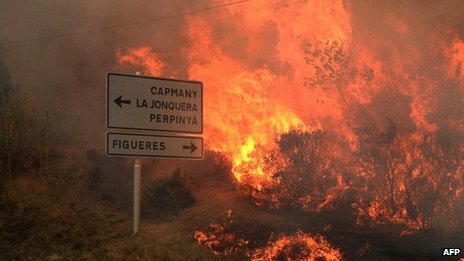 The number of British tourists ambushed on Spanish roads has soared as the euro crisis has deepened, with the British Embassy in Madrid reporting a 10 per cent rise in the first quarter of this year. This is likely to increase further as the peak holiday season begins. A spokesman for the embassy said: ‘Motorists may be driving along the motorway and not notice there’s a car close up behind. ‘Someone in the other car throws a stone at their vehicle which creates a loud bang. The British drivers pull over to see what has happened and the gang is behind them. 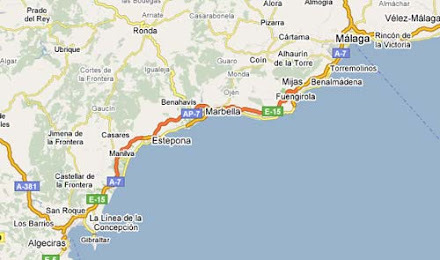 A hotspot for the gangs is the AP7 motorway between the French border and the Alicante region in southern Spain. More than 140 cases of theft on this route were reported to British Consulates last year. However, a spokesman said there were likely to be ‘hundreds more’ attacks going unreported across Spain because victims usually contact a British consulate only if they have lost their passport. Dave Thomas, consular regional director for Spain, said: ‘Be on your guard against anyone who attempts to stop you or ask you for help. Stephen and Helen Robinson, from Desford, Leicestershire, had their bags stolen from their Audi Q5 as they stopped to walk their labrador retriever Polly at a service station between Barcelona and Valencia. The couple, who are in their 50s, were standing at the boot of their car when a man on a mobile phone asked them how to say something in English. While he distracted them, their belongings were taken from the front of the car, despite Polly being inside. In a separate incident, Joy and Alan Horton, from Bury St Edmunds in Suffolk, were driving a Ford Focus hatchback through Spain when they heard a loud bang and pulled over. A car that had been travelling close behind them also stopped, and while the driver talked to them, his accomplice stole their possessions without them noticing. 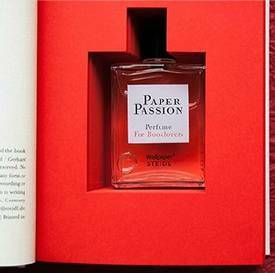 Paper Passion, a scent from Geza Schoen for Wallpaper* magazine, makes its wearers smell like freshly printed books. I suppose it can be alternated with "In the Library," a perfume that smells like old books. It comes packaged with inside a hollow carved out of a book with "texts" by "Karl Lagerfeld, Günter Grass, Geza Schoen and Tony Chambers." The World Wildlife Fund’s branch in Spain has ousted King Juan Carlos as its honorary president — a title he’d held since 1968 — after deciding his recent elephant hunting safari was incompatible with its goal of conserving endangered species. The announcement Saturday was the latest in a string of bad news for Spain’s royal family, which has been embarrassed by legal and other scandals. The fund said in a statement that “although such hunting is legal and regulated” it had “received many expressions of distress from its members and society in general.” It said members voted at a meeting Saturday in Madrid to “to get rid of the honorary President” by a substantial majority of 226 votes to 13. The Royal Palace declined immediate comment on the announcement. Many Spaniards were dumbfounded when news broke in April that the king had made a secret journey to hunt elephants in Botswana even though it was widely known he was president of the Spanish branch of the fund. Such an opulent indulgence also angered Spaniards at a time when national unemployment hovers around 25 percent, the economy is contracting and there are fears the country may need an international financial bailout. The Spanish public learned of the safari only after the king had to fly back in a private jet to receive emergency medical attention for a broken hip suffered during the trip. In an unprecedented act of royal contrition, a sheepish Juan Carlos apologized, saying as he left the hospital: “I am very sorry. I made a mistake. It won’t happen again.” It was a poignant moment because the royal family had been under intense media scrutiny for all the wrong reasons. The king’s son-in-law, Inaki Urdangarin, is a suspect in a corruption case, accused of having used his position to embezzle several million euros in public contracts through a supposedly not-for-profit foundation he’d set up. Over Easter, the king’s 13-year-old grandson, Felipe Juan Froilan, shot himself in the foot with a shotgun, even though Spanish law dictates you must be 14 to handle a gun. The king on Tuesday decided to take a pay cut in solidarity with civil servants who are to lose their traditional Christmas bonuses as part of the government’s most recent austerity drive. The salaries of Juan Carlos and Crown Prince Felipe will be reduced about 7 percent — to about 272,000 euros ($334,000) and 131,000 euros ($160,000) respectively — in line with government policy, the Royal Palace said. The king and prince acted voluntarily in cutting their salaries, the palace said. Spanish miners and sympathizers have clashed with riot police on one of Madrid's most famed avenues, and six demonstrators were hospitalized after police fired rubber bullets. The violence on Wednesday came after the miners marched for nearly three-weeks from the remote regions. In Madrid they were joined by other Spaniards incensed with the nation's seemingly endless austerity cutbacks. Some miners walked from northern and eastern mining regions into Madrid, where they received a hero's welcome by thousands lining La Castellana avenue outside the Industry Ministry building. The miners detonated deafening fireworks as they marched, then hurled them at the police riot vans guarding the ministry, which oversees the mining industry. Police fired rubber bullets at the ground as a warning, and opened fire on the protesters after they threw more fireworks and rocks and bottles at officers, witnesses said. Spain's tourism industry is bracing itself for a painful slowdown in bookings this summer, driven by a steep decline in local tourism, according to the country's leading hotel association. Reservations by Spanish vacationers for the month of July are 30% lower than last year, amid persistently high unemployment and a protracted economic recession, said Juan Molas, president of the Spanish Confederation of Hotels and Tourist Accommodations. An influx of visitors from Russia and other countries in Eastern Europe has compensated somewhat for the decline in local tourism, but weak local demand is expected to weigh on an industry that accounts for about 11% of Spain's annual economic output. Hotel owners are concerned that the government may raise the industry's value-added tax to 18% from the current 8%, in a bid to reduce its yawning budget deficit, making Spain less attractive to foreign tourists compared with other less expensive destinations "If the VAT rises to 18%, it will be absolutely catastrophic for the sector," Mr. Molas said at an event Thursday in Madrid. Spain's government is working to secure €100 billion ($126 billion) in aid for its struggling banking sector from the European Union and plans to meet with EU officials next week to discuss new measures to improve its public finances. Prime Minister Mariano Rajoy has already implemented €45 billion in austerity measures, but weak tax revenue threatens to undermine his administration's goal of trimming its shortfall this year to 5.3% of gross domestic product from 8.9% last year. Sentiment in the hospitality industry is at its lowest level since 2009, according to an index developed by the hotel association and consulting firm PwC. Based on a survey of hotel firms, 57% of operators expect international tourism will hold steady this year, while 76% expect domestic tourism to decline. "The parts of the country that will suffer the most are those that cater to national tourists," Mr. Molas said. Next time if you get a missed call starting with +92; #90 or #09, don't show the courtesy of calling back because chances are it would lead to your SIM card being cloned. The telecom service providers are now issuing alerts to subscribers —particularly about the series mentioned above as the moment one press the call button after dialing the above number, someone at the other end will get your phone and SIM card cloned. According to reports, more than one lakh subscribers have fallen prey to this new telecom terror attack as the frequency of such calls continues to grow. Intelligence agencies have reportedly confirmed to the service providers particularly in UP West telecom division that such a racket is not only under way but the menace is growing fast. "We are sure there must be some more similar combinations that the miscreants are using to clone the handsets and all the information stored in them," an intelligence officer told TOI. General Manager (GM) BSNL, RV Verma, said the department had already issued alerts to all the broadband subscribers and now alert SMSes were being issued to other subscribers as well. As per Rakshit Tandon, an IT expert who also teaches at the police academy (UP), the crooks can use other combination of numbers as well while making a call. "It is better not to respond to calls received from unusual calling numbers," says Tandon. "At the same time one should avoid storing specifics of their bank account, ATM/ Credit/Debit card numbers and passwords in their phone memory because if one falls a prey to such crooks then the moment your cell phone or sim are cloned, the data will be available to the crooks who can withdraw amount from your bank accounts as well," warns Punit Misra; an IT expert who also owns a consultancy in Lucknow. The menace that threatens to steal the subscriber's information stored in the phone or external memory (sim, memory & data cards) has a very scary side as well. Once cloned, the culprits can well use the cloned copy to make calls to any number they wish to. This exposes the subscribers to the threat of their connection being used for terror calls. Though it will be established during the course of investigations that the cellphone has been cloned and misused elsewhere, it is sure to land the subscriber under quite some pressure till the time the fact about his or her phone being cloned and misused is established, intelligence sources said. "It usually starts with a miss call from a number starting with + 92. The moment the subscriber calls back on the miss call, his or her cell phone is cloned. In case the subscribers takes the call before it is dropped as a miss call then the caller on the other end poses as a call center executive checking the connectivity and call flow of the particular service provider. The caller then asks the subscriber to press # 09 or # 90 call back on his number to establish that the connectivity to the subscriber was seamless," says a victim who reported the matter to the BSNL office at Moradabad last week. "The moment I redialed the caller number, my account balance lost a sum of money. Thereafter, in the three days that followed every time I got my cell phone recharged, the balance would be reduced to single digits within the next few minutes," she told the BSNL officials. New motoring laws have come into force in France making it compulsory for drivers to carry breathalyser kits in their vehicles. As of July 1, motorists and motorcyclists will face an on-the-spot fine unless they travel with two single-use devices as part of a government drive to reduce the number of drink-drive related deaths. The new regulations, which excludes mopeds, will be fully enforced and include foreigner drivers from November 1 following a four-month grace period. Anyone failing to produce a breathalyser after that date will receive an 11 euro fine. French police have warned they will be carrying out random checks on drivers crossing into France via ferries and through the Channel Tunnel to enforce the new rules. Retailers in the UK have reported a massive rise in breathalyser sales as British drivers travelling across the Channel ensure they do not fall foul of the new legislation. Car accessory retailer Halfords said it is selling one kit every minute of the day and has rushed extra stock into stores to cope with the unprecedented demand. Six out of 10 Britons travelling to France are not aware they have to carry two NF approved breathalysers at all times, according to the company. The French government hopes to save around 500 lives a year by introducing the new laws, which will encourage drivers who suspect they may be over the limit to test themselves with the kits. The French drink-driving limit is 50mg of alcohol in 100ml of blood - substantially less than the UK limit of 80mg. The number of Britons arrested overseas is on the rise, official figures have shown. The Foreign Office (FO) handled 6,015 arrest cases involving British nationals abroad between April 2011 and March 2012. This was 6% more than in the previous 12 months and included a 2% rise in drug arrests. The figures, which include holidaymakers and Britons resident overseas, showed the highest number of arrests and detentions was in Spain (1,909) followed by the USA (1,305). Spanish arrests rose 9% in 2011/12, while the United States was up 3%. The most arrests of Britons for drugs was in the US (147), followed by Spain (141). The highest percentage of arrests for drugs in 2011/12 was in Peru where there were only 17 arrests in total, although 15 were for drugs. The FO said anecdotal evidence from embassies and consulates overseas suggested many incidents were alcohol-fuelled, particularly in popular holiday destinations such as the Canary Islands, mainland Spain, the Balearics (which include Majorca and Ibiza), Malta and Cyprus. Consular Affairs Minister Jeremy Browne said: "It is important that people understand that taking risks abroad can land them on the wrong side of the law. 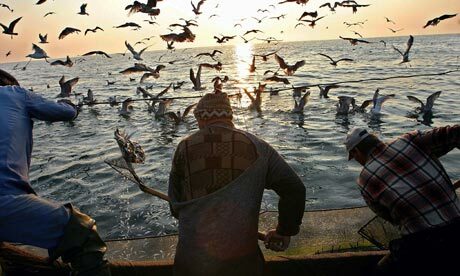 "The punishments can be very severe, with tougher prison conditions than in the UK. While we will work hard to try and ensure the safety of British nationals abroad, we cannot interfere in another country's legal system. "We find that many people are shocked to discover that the Foreign and Commonwealth Office cannot get them out of jail. We always provide consular support to British nationals in difficulty overseas. However, having a British passport does not make you immune to foreign laws and will not get you special treatment in prison."